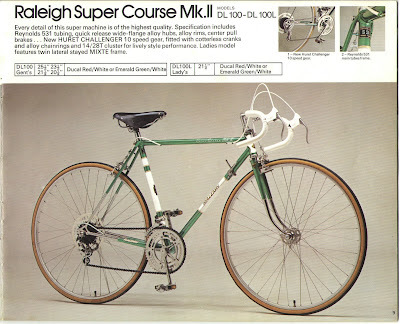 My next fixie project is a Raleigh Super Course MKII but what but finding the exact year of the frame is of course a challenge and half the fun of acquiring bikes where you have no idea as to the actual pedigree. I don't recall where I saw this but according to the serial number on the bottom bracket, which starts with WB, this series was made in England in 1975. The picture above is from the 1974 catalog. Here is how the bike looked when I first brought it home. I traded a six-pack of Bass Ale for it. It's a 59cm frame, so it looks like it will be rideable for me. Below is how it looks now with mustache bars. Riding around the driveway it feels good but I definitely need a track wheel in the back, which I am working on acquiring. Looks like the original MkII had a Brooks Saddle so I will have to use the Brooks that I got off the Peugeot. Detailing on the lugs is pure artwork. Too bad the stickers were so lousy that most of them have come off. Wish I could have scored that for a six pack. Looks sweet. Too rich for me, I just had to send my rear shock to Push for overhauling. Thanks for the heads up though.